Environmental Progress is working with our friends and allies in South Korea to save its nuclear plants, and protect its valuable nuclear export business. EP published a comprehensive report, "The High Cost of Fear," outlining the impacts of a proposed nuclear phase-out in South Korea. A copy of the report can be found here. 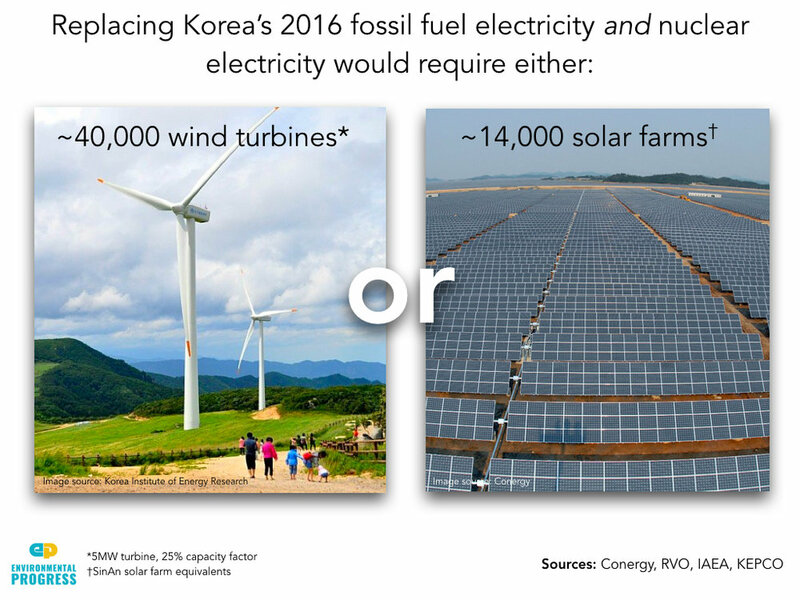 EP sent an open letter to South Korean President Moon Jae-in in July 2017 urging him to reconsider his phase-out proposal given the importance of South Korea's nuclear program to protecting the climate. South Korea's largest newspaper published a long interview with Michael Shellenberger and an op-ed about why he changed his mind about nuclear. EP wrote President Moon again in August warning of misinformation being spread by Greenpeace. And in October, EP wrote the "citizens jury" created by President Moon to make a comprehensive case for saving the country's nuclear plants, and warning of misinformation from anti-nuclear groups. EP has published two investigative pieces on work by Greenpeace [also in Korean] and Friends of the Earth (FOE) [in Korean] to kill nuclear energy in South Korea. Nuclear power is a key component to achieving peace with North Korea and improving relations among world powers. Pulitzer Prize winner Richard Rhodes and Michael Shellenberger co-authored an op-ed in Foreign Affairs urging peace talks and the use of nuclear energy as an incentive for North Korea. Environmental Progress coordinated an open letter signed by Rhodes and climate scientists including Jim Hansen, urging peace talks. South Korea is the world leader in nuclear. South Korea's 25 nuclear reactors provide it with one third of its total electricity. Nuclear capacity in the country was set to increase from 23 GWe to 38 GWe by 2029, but under newly elected President Moon Jae-in, South Korea plans to completely phase-out its nuclear sector by 2060. Without nuclear, South Korea’s emissions would increase the equivalent of up to 27 million cars added to the road. Ten South Korean labor, student, and academic leaders will receive the James Hansen Courage Award for their successful defense of nuclear power on Thursday, October 26 in two separate ceremonies in Ulsan and in Gyeongju. The distinction will be awarded to the 10 South Korean pro-nuclear leaders by Environmental Progress (EP) President and Time Magazine “Hero of the Environment” Michael Shellenberger. “The High Cost of Fear,” a new in-depth Environmental Progress report, uses publicly available data, the best-available peer-reviewed scientific research and simple methods to calculate economic and environmental impacts of a nuclear phase-out in South Korea. If measured against the average U.S. car mileage, it would increase carbon emissions the equivalent of adding 15 - 27 million cars to the road, an amount that would prevent South Korea from achieving its Paris climate commitments. Last fall, a South Korean filmmaker released the trailer for "Pandora," a feature-length disaster movie that opens with a nuclear power plant exploding. After it was accused of secretly financing the film, whose filmmaker claimed cost just a half-million dollars, Greenpeace insisted it had merely funded the screenings, street protests and lawsuits. Leading South Korean newspaper Chosun interviewed Michael Shellenberger about his recent visit to South Korea to help save its nuclear power. Read the full English translation of the article here. Leading South Korean newspaper Chosun published an op-ed by Michael Shellenberger, in which he discusses the global importance of South Korea's nuclear energy. Read the original English version here. Leading South Korean newspaper Chosun Biz interviewed Michael Shellenberger and asked him why American environmentalists and scientists sent a letter to President Moon. Read the full English translation of the article here.